PITTSBURGH, PA -- Two men ambushed a backyard cookout near Pittsburgh, killing a pregnant woman, her 8-month-old fetus and four other adults, because they wanted retribution for the 2013 slaying of a friend, authorities said. 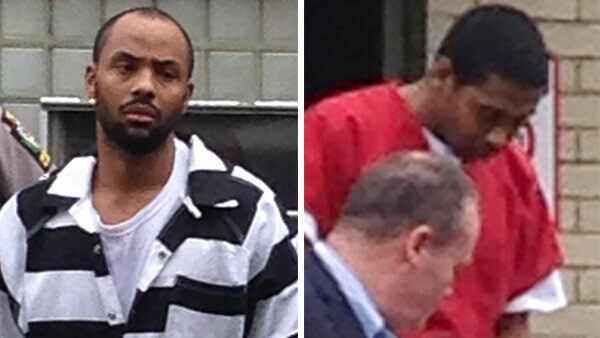 Cheron Shelton, 29, and Robert Thomas, 27, have each been charged with six counts of criminal homicide for the March 9 ambush in Wilkinsburg, Allegheny County District Attorney Stephen Zappala Jr. announced Thursday. Thomas fired 18 shots from a .40-caliber pistol into about 15 partygoers, prompting them to run toward a rear porch, Zappala said. That's where Shelton, hiding behind a fence, peppered them from five feet away with 30 shots from a rifle similar to an AK-47, killing the victims, Zappala said. Shelton blamed Lamont Powell, one of three people wounded, for killing his best friend three years ago, Zappala said. Nobody's been charged in the 2013 killing, though police have called Powell a suspect. Two unnamed jailhouse witnesses, who spoke with the suspects after they were taken into custody on unrelated charges weeks after the shooting, described Shelton's alleged bloodlust, according to criminal complaints. One of the witnesses said Thomas indicated Shelton wanted to shoot more people at the cookout victims' funerals, but Thomas claimed to have talked him out of it. "I'm trying to treat them like the Jews; I'm trying to eliminate their whole blood lines," Thomas told the witness, quoting Shelton's intentions, according to police. A second witness said Shelton "told him he was 'hitting them' with the 'chopper'" - street slang for an AK-47 - "and that he wanted everyone gone," investigators said. Thomas also expressed remorse to the witness, authorities said. The witness quoted Thomas saying: "Yeah, it's killing me, crushing me every day. I'm trying not to think about it. I'm trying not to become a vegetable." Thomas' attorney, Casey White, said he wouldn't comment on the accusations until after he reads the complaint and talks to his client. He and Shelton's lawyer previously said their clients were innocent. Earlier this week, the men's attorneys attempted to get Shelton and Thomas out of jail, claiming both were unfairly being kept in solitary confinement to "squeeze" them for information on killings they knew nothing about. The slain victims were Brittany Powell, 27, who was renting the home and living there with her child, and her siblings: Chanetta Powell, the 25-year-old pregnant woman, and Jerry Shelton, 35. The county medical examiner ruled Chanetta Powell's unborn son died because of her death. The others killed were the siblings' cousin, Tina Shelton, 37, and their friend, Shada Mahone, 26. Cheron Shelton is not related to the victims and planned the shootings with Thomas after a friend called to tell them a Facebook post indicated Lamont Powell was at the cookout, police said. "Nobody else was involved in this. They planned it. They carried it out," Zappala said of the two suspects. Police said they also have surveillance video from about 25 minutes before the shootings showing Shelton in a car after carrying a long, slender object. They say other video from a nearby home shows the same car turning onto the street where the shooting occurred minutes later. Police said they also have information from 31 calls or text messages between Shelton and Thomas' cellphones that night, but didn't release details. Both men are also charged with six counts of aggravated assault and reckless endangerment for the three others wounded, and three children in the house but unharmed when bullets pierced its walls. They are also charged with criminal conspiracy. Police haven't found either weapon, but they believe Shelton gave someone instructions to dispose of the rifle using hand signals during a recorded jailhouse visit. They said Thomas also told one witness he had ditched his gun. "I'm cool," Thomas is quoted in court papers. "They gonna have to go deep sea diving for mines."